That is all folks, Thank You for choosing Sport24 to catch this epic Soccer World Cup semi-final clash between Croatia and England. Sadly, its not coming home for the Three Lions but Croatia have a chance to make history if they win against France. For now, enjoy the rest of your evening. Pitso Mosimane: "After going to penalties twice (against Denmark and Russia) Croatia have NINE lives ..."
England should feel proud, in which they are, as they punched above their weight (third youngest team at the World Cup). 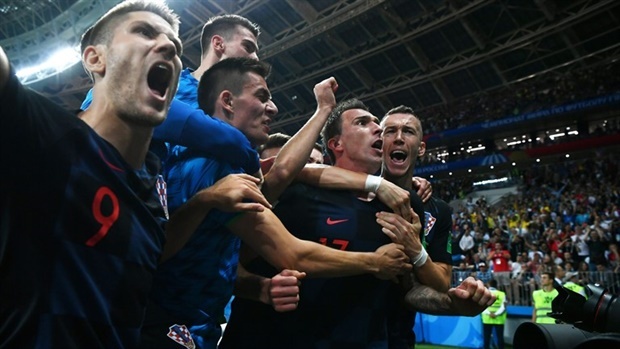 Croatia's individual experience came in handy. After Trippier's early goal, England were too cagey and well aware of their lead in which they tried to protect. Croatia just got better as the match progressed. Rakatic and Modric slowly started to dictate things with Mandzukic, who was quiet for majority of the game was a fox in the box when his chance came. Heartbreak as the England players fall to the ground as the Croatian bench storms the field. ELATION! 119' Kramatic is onside and decides to go all on his own and pulls the trigger just before running out of steam. His effort hits the side netting. 118' Luka Modric is replaced with Badelj coming on. 116' CHANCE! Rakatic fizzes a shot towards goal only for Pickford to save it. 116' Southgate issuing instructions to Vardy. Ever calm to be honest. 115' Mandzukic is replaced by Corluka. 112' Substitution: Vardy is now on for Kyle Walker. 107' Rakatic takes the corner-kick quickly and Brozovic leaps forward and pulls the trigger but his short is over the crossbar from an awkward angle! Mandzukic receives a searching ball in which he can just tap in side the net but Pickford rushes out and punches the ball away. 103' Rose has shown great impetus going forward. England showing effort but tired legs out there. 101' Rebic is replaced by the in-form Kramaric. 99' Off the line! Stones gets up brilliantly, heads towards the far corner, and Vrasaljko heads off the line! Stones completely unmarked, but did superbly to head from 10 yards out! 98' And almost immediately Dier brings energy into the match with powerful strike that deflects off a Croatian shirt and out for corner-kick. Nothing comes off the corner but England looking better. 97' Finally Henderson is replaced. 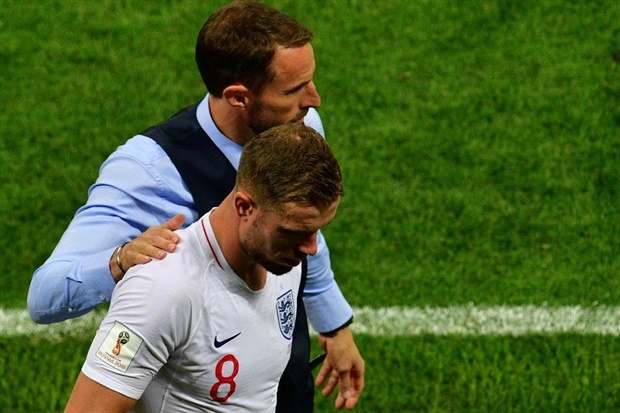 Southgate introduces Eric Dier into the match. 95' Rose already giving England that necessary width and is fouled in the centre of Croatia's half, after wiggling his way towards the right. Rebic brings the Spurs wing-back down and gets a yellow card. 92' Southgate might be superstitious with keeping Henderson on. The Liverpool midfielder, in his last 30 outings with England, has not LOST a single match. 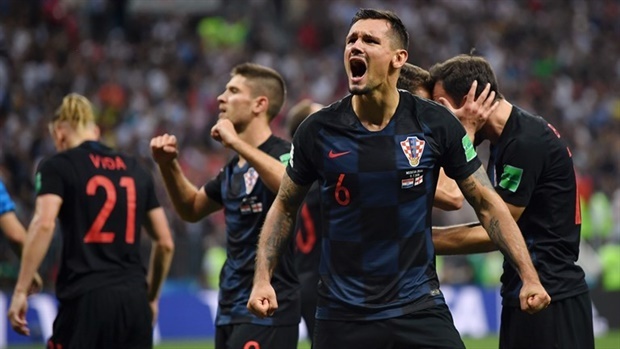 Tense affair and Croatia look the better side after the final whistle was blown. England need need fuel in the middle of the park. Loftus-Cheek and Eric Dier could offer that. 91' FREE-KICK ... Tripper stands behind and dinks in a searching cross, where Kane losses his marker to header the ball down and wide. 88' Croatia's experience really showing here as it has in their two previous games (Russia and Denmark). 87' Loftus-Cheek or Eric Dier could bring life into England's midfield. Southgate should ponder on that change (replacing Henderson). Lingard chasing shadows as well. 84' CHANCE! What a ball by Modric into the box. Mandzukic collects it at a slight angle on his chest, he manages to get a half volley off, but Pickford beats it away! 82' Croatia seeing a lot of the ball here. More than they have ever in the past 70 minutes. 80' Tense match now. Nerves and emotions can be felt from the crowd. No player wants to put a foot wrong. Croatia have momentum on their side. The youthful England side need nerves of steel and possibly a breather and word from their coach Southgate. Could we be heading for Extra-time? 77' And just as I say that, Henderson scuffs up a nervy pass towards Lingard and rather shoots for goal. Needs to be composed. FULL TIME! CROATIA ARE THROUGH TO THE WORLD CUP FINAL! England's run is over. France awaits Croatia in Sunday's final. Good news for England, there will be four minutes of stoppage time. Substitution: Captain Luka Modric makes way for Milan Badelj. Substitution: Mandzukic down with cramp again, and he's finally being brought off. Corluka replaces him. Substitution: Vardy is now on for Kyle Walker. GOOOOOOOOAL! Heartbreak for England! Mandzukic with the goal! The ball loops up high around 30 yards out, and Perisic wins a header above Trippier. Mandzukic steals it and makes no mistake from six yards out. Croatia 2-1 England. Chance! England asleep! Modric finds Brozovic inside the box, low about 12 yards out from the corner, but his left-footed effort is high and wide! Clever corner, not well executed. SECOND HALF: We are back underway after a very short break. Croatia are 15 minutes away from a third consecutive penalty shootout. HALF TIME: 15 more minutes before penalties. Somehow, there will be two minutes of added time at the end of this half. Weird, considering there was only one added on for the whole first half of normal time. Substitution: Rebic is off, replaced by Kramaric. Off the line! ohn Stones gets up brilliantly, heads towards the far corner, and Vrasaljko heads off the line! Stones completely unmarked, but did superbly to head from 10 yards out! Substitution: Henderson now gives way to Eric Dier. Booking: Rebic finally gets a yellow for a cynical foul on Rose as he galloped into the final third. Substitution: Ivan Strinic is off for Pivaric. England on the front foot early on. Rose is visibly far higher up the pitch already. I can't quite believe Croatia haven't made a change yet. Substitution: Ashley Young is replaced by the fresh legs of Danny Rose at left-back. EXTRA TIME: We're back underway! England have made a change after a short interval. FULL TIME: Extra time, here we come! France will be loving this. Three minutes of stoppage time. If nobody scores before they're over, we'll be heading to extra time. England have to stay firm here. Strinic gets across the face of the box and sticks it out wide to Perisic, but it's just a yard too far to his side and out of play! Save! Pickford fails to properly punch a deep cross, and it falls to Perisic very quickly. He looks to dink it over the crowd and into the empty net, but it's over the bar! Not a huge chance, but a half one. What a ball by Modric into the box. Mandzukic collects it at a slight angle on his chest, he manages to get a half volley off, but Pickford beats it away! Now England are coming on strong! Henderson sees a ball into the box cleared back to him, but be balloons a half-volley over the bar! He had options left and right. Lingard gets in-behind at an acute angle from Kane's ball, but he goes for goal instead of squaring! Dragged past the post and out for a throw-in. Substitution: Rashford is on for Sterling for the last 15 minutes. Post! Perisic steps over the ball on the left of the box, finds a yard and sticks it bottom right corner, but it bounces off the post and Mandzukic's rebound falls into Pickford's hands! GOAL! Perisic puts Croatia level with an outstretched, high boot. The ball bounces narrowly passed a diving Pickford. Perisic gets in front of Trippier and Walker to get on the end of Vrsaljko's brilliant ball from the right. 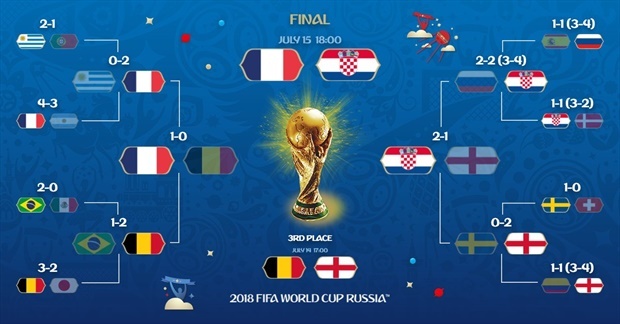 Biggest chance for Croatia by far! John Stones clears a cross as far as Perisic, whose fierce effort from 20 yards is blocked by Walker, in the nether regions!! It looked to be heading for the bottom corner. Croatia are seeing more of the ball, but they're not doing much with it. Trippier clears a deep ball, but Rakitic balloons it over the bar on the half volley. Chance! Lovely fast move by England as Kane nods down a long ball, Sterling touches it onto Lingard, and his half volley is blocked for a corner. Trippier takes, but Perisic forces it away! Corner to Croatia. Rakitic takes, but gives England the free-kick for a foul on Maguire! Lovren makes the foul. He's been rattled all game. Booking: Walker fouls Rebic and then receives a booking for holding onto the ball as Croatia players tried to get it off him! Still not much to report on so far in this half, which has been a much, much quieter start than in the first. An update from VAR, the booking has actually been awarded to Mario Madzukic, not Rebic. A fairly quiet opening to the half so far. Booking: Finally a booking, and it goes to Rebic for a flailing arm, which catches Kyle Walker. SECOND HALF: We're back underway for the second half. HALF TIME: Trippier's free-kick separates the sides at the break. England 1-0 Croatia. There will be one minute of added time at the end of the half. There are five minutes of normal time in the first half remaining. Sterling shoots inside the box when he should have squared for Alli. It's blocked, before Trippier's fierce cross goes over everybody and out of play. Chance! Croatia defenders are slipping all over the shop, this time it's Vrsaljko to allow Alli some space. He squares for Lingard on the edge, but his curling effort for the far post goes a couple yards wide! Croatia look dangerous for the first time! Stones does brilliantly to slide clear inside the six-yard box from Rebic's dangerous low cross. It falls back to Rebic, but his effort is straight down the throat of Pickford! Sterling does brilliantly on the left, beating Lovren in a foot race, taking over and then drawing the foul! No yellow still for Lovren. Vida slips again as Lingard gets into space, but his square ball goes awry. Young then commits and allows Rebic to get on the ball, but his cross from very deep is so rushed and easy for Pickford. Offside! Subasic's terrible clearance is missed by Rakitic, allowing England in. Sterling picks it up, plays in Kane, who puts it wide one-on-one! Luckily for him, he was a couple yards offside. What a block from John Stones. Rebic picks the ball up as Maguire's sloppy play lets him in, but his left-footed effort from 20 yards is blocked well. Chance! It opens up for Perisic, cutting in from the left, and he shoots low to Pickford's right but a yard wide. It took a nick off Kyle Walker, but goal kick given! He's furious. Sterling is causing a bit of havoc here, despite not being on the ball too much. Croatia are having to drop a tad deeper, because he has the beating of Vida with complete ease. Chance! England win another corner, Trippier delivers this time, Maguire wins it 12 yards out, but it's a yard or so wide of Subasic's left-hand post! England win a corner as Brozovic's tackle 50 yards out balloons out. Young takes but Harry Maguire is adjudged to have fouled in the box as he heads over the bar. Croatia win a corner as Young hesitates at the back post with Vrsaljko on his back. Modric steps up, towards Mandzukic, but England eventually get it away. Raheem Sterling is played in-behind Strinic and looks to run onto it inside the box, but Subasic is out well! GOAL! Trippier scores from the free-kick! Perfectly placed, over the wall and passed Subasic. What a strike! Trippier's first international goal and England take the lead. Free-kick! Great position for England here, 25 yards out in a central position as Modric gets the wrong side of Alli! Ashley Young and Kieran Trippier stand over the ball. A couple of throw-ins for England inside their own half. Neither side has found their rhythm just yet. Pickford goes long towards Young, but it's out for a throw. KICK OFF: We're underway! 90 minutes - or perhaps 120 - separate one of these two sides from a place in the World Cup Final on Sunday! The teams are making their way out onto the field. Kick-off will follow the two national anthems. The big news from Croatia is that Sime Vrsaljko and goalkeeper Daniejel Subasic are fit to start, meaning their only change sees Marcelo Brozovic replace Andrej Kramaric in the starting eleven. For the third game running, Gareth Southgate names an unchanged side ahead of the biggest game in English football for a generation. Despite being the designated 'home' team, Croatia are in their change strip while England are wearing all-white. England XI: Pickford, Walker, Stones, Maguire, Trippier, Henderson, Young, Lingard, Alli, Sterling, Kane. Croatia XI: Subasic, Vrsaljko, Strinic, Lovren, Vida, Rakitic, Modric, Brozovic, Perisic, Mandzukic, Rebic. The winners of tonight's match will face France - who knocked Belgium out last night - at this very stadium on Sunday in the World Cup final. Could it really be coming home? Good afternoon and welcome to our coverage of tonight's World Cup semi-final between Croatia and England, live from the Luzhniki Stadium in Moscow.